Can I fall in love at first sight and at first bite? Yes, I can and I did tonight at The Bazaar! My restaurant week adventure continues with dinner at The Bazaar. Bazaar is located inside the posh SLS Hotel and the restaurant decor is fun and trendy with dashes of mystery and romance. There are nooks, curtained spaces and different seating (booths, tables, low tables, outside seating, etc. ); combined with the art, tarot card readers (on weekends) and amazing food and presentation, you'll feel like you're at a special dinner at a party. This is not just another restaurant to answer the age-old question of "what are we having for dinner tonight." 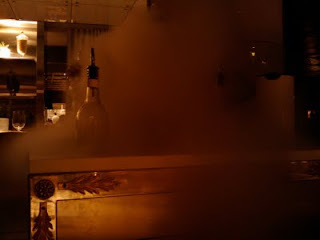 This "fog" was from the "Liquid Nitrogen Caipirinha" that was made tableside. 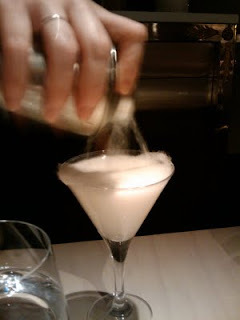 It was so much fun to watch the bartender make this cocktail. What a great way to start our dinner! 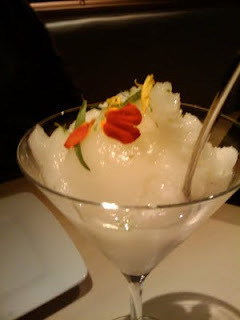 They definitely don't skimp on the alcohol and even though the cocktail is technically frozen, the "ice" is so smooth that I imagine that's what a cloud would taste like if I could actually taste a cloud. There is no ice crunchiness at all. Edible flowers add a beautiful touch. Mojito is poured over a wad of cotton candy. Creative pairing and presentation but the drink was a bit too sweet for me and wasn't strong enough on the alcohol front. Delicious! We could've eaten ten of those each. I know...wishful thinking. 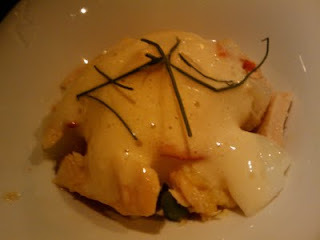 We added three things not on the prix-fixe menu that we really wanted to try. This was one of them and it was totally worth it. 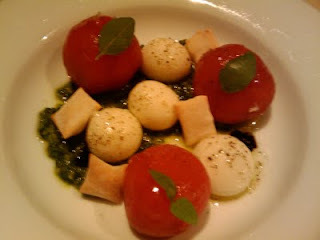 The liquid mozzarella was creamy and it's the perfect bite when you spoon it into your mouth with the sweet n' tart cherry tomato and some pesto at the same time. "Olives ~ traditional and modern"
This was second thing we ordered extra because someone highly recommended the olives to me. You start with the traditional olives stuffed with anchovies and then finish with the liquid olives which you should savor in your mouth for a few seconds before swallowing. This was good but it was a bit too salty for us to eat two each. One of each would have been just right. 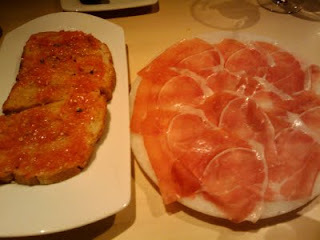 You cannot go wrong with Serrano Ham and the bread with the fresh tomato topping was a very tasty pairing. 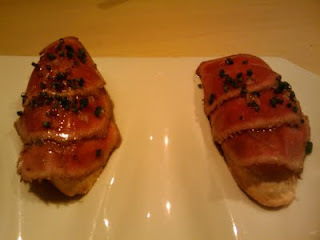 I heart Jamon Serrano...seriously...see my August post about cooking fresh Iberico de Bellota if you don't believe me. Our third and final add-on to our prix-fixe dinner and we're so glad we got it. Again, we dream of eating ten of these sweet and savory "heavens." A cube of foie gras is wrapped in the cotton candy and this is best eaten by putting the whole thing in your mouth all at once. 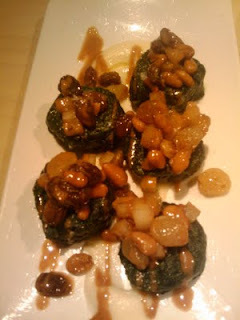 This is the one tapa we didn't really care for. 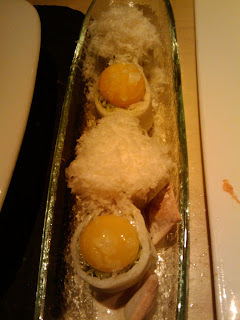 A thin slice of jicama wraps the lettuce, anchovy and dressing and the "roll" is topped with either a quail egg yolk or parmesan cheese. 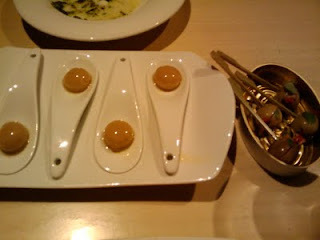 The cheese and quail egg yolk were yummy but the rest were blah. This was tasty but it didn't blow us away. It was like a really, really good tuna salad. 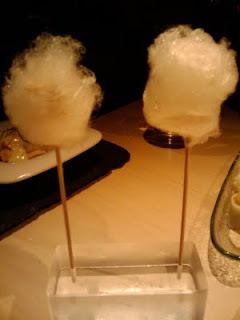 I guess it's a little hard to blow us away after that awesome foie gras cotton candy. I spoke too soon. This shrimp was delicious and cooked perfectly. 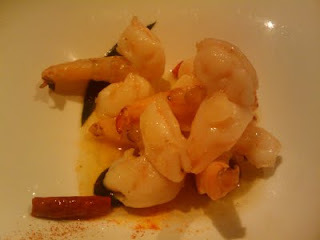 All shrimp should be cooked like this - fresh and just done so it's not rubbery, mealy or dry. I think I need more than ten of this...twenty sounds about right. I wish all my spinach...heck, all my vegetables...could be served like this. This was bursting with flavor with the roasted pine nuts and fruit and the spinach didn't have that "irony" and rough taste/texture that it usually has. A perfect carnivore finish to an amazing dinner. The steak was cooked medium-rare as requested. 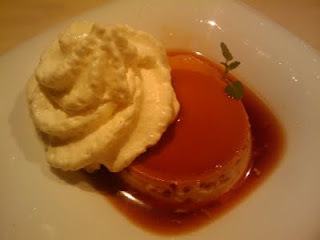 I usually hate flan because it's too sweet and the flan falls apart after a couple of jabs. I love this one though because I could really taste the richness of the eggs and milk and the sugar in the flan and caramel sauce wasn't overpowering. The whip cream was a nice touch too. You can never go wrong with chocolate. 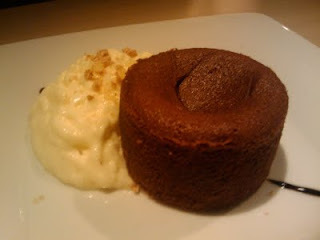 A chocolate river gushes out of the cake after the first jab of your fork. 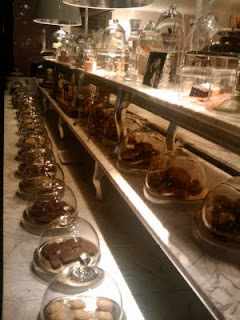 My friend and I were full after dinner but of course, we had to visit the dessert shop next to the restaurant; looking never hurt. We definitely have to return for their dessert tasting or high tea and try their in-house chocolates, cakes, pastries and ice cream. So yes, love at first sight (the restaurant and that wow-wow-wow liquid nitrogen cocktail) and love at first bite (Philly Cheesesteak) is really possible. I admit I'd love to come back here with a date; fun and delicious, that's at least half the recipe for a good dinner date. P.S. 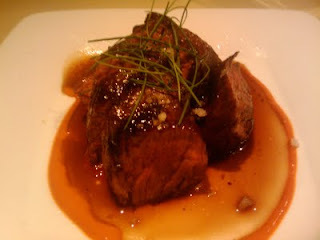 I was dying to have my birthday dinner at Bazaar this year but it didn't happen. But hey, there's no rule against celebrating four months late and also, girl's night out is just as special. Thank you Coolia for organizing this fabulous dinner. I just don't see how people can have a bad time here. Beautiful room, douchey gorgeous people, fun filled food, now at a discount!